Fishing for Coosa River spotted bass and largemouth bass (both found in huge numbers on Logan Martin Lake this summer season), does have its rewards. This holds true whether you decide to fish during the day or at night. 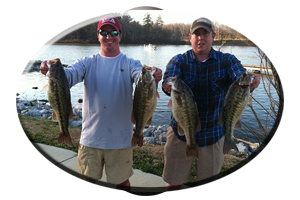 There are numbers of trophy sized bass in each of these categories to be taken by anglers while both day and night fishing this very recreational lake (only 30 miles from Birmingham), when temperatures soar. But be prepared to have some company on some locations for it does get crowded from June until about September. At times, it seems like every type of recreational water vessel is on the water at the same time you are. But have no fear, there are many ways you can escape the crowds this summer…and still catch fish! Knowledgeable anglers, those that frequent Logan Martin lake during the summer months, know how to avoid those crazy, midday sessions. Those times when dozens of jet skies, water skiers, pontoon parties and all kinds of anglers like cat fisherman, crappie chasing anglers and the ever growing list of bass anglers, all seem to be touring the main lake at the same time you are. When everyone from all walks of life all converge on one spot, its very hard to concentrate on your fishing. With these things zooming by every few minutes – creating following waves and wakes – it can have you bobbing up and down like an over sized cork float. Its hard to expect a good day of fishing with all of these hindrances going on. Its also hard for any angler to expect these bass to bite with all of this going on over head. So, is there a solution? Yes, there are many. Some anglers simply resort to night fishing to get away from the stifling heat and the ever growing summer time crowds. 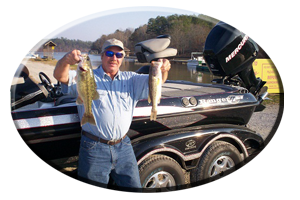 Other anglers, those more competitive in their angling skills, usually give up their day time fishing all together, while resorting to competing in the many nighttime bass tournaments that are held lake wide. 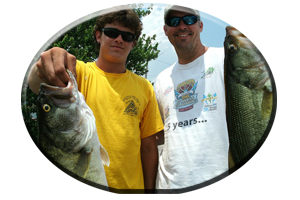 Some bass tournaments are held on weeknights and some are held on weekends after dark, usually on Friday evenings, Saturday evenings or some bass tournaments go on all night. That’s OK for some anglers, those that have variable schedules. For night fishing requires adjusting to some very odd hours and then always having to recuperate afterwards. For some anglers, fishing during the daylight hours is all they can do. So even though its hot, they have no choice but to fish when their work or family schedules allow. Still, there are many ways to make it work – for those that do fish only during the day. Getting on the water early (like around 5 a.m. Central time during summer), is one solution to beat the heat and avoid the summer crowds. This means launching your boat at least 30 minutes before dawn to be on your best fishing spot early or otherwise having to run in the early morning light. So running lights (and a spot light for navigating) are still a must, just like when night fishing. Check all lights beforehand and have them in on when launching and on when running the boat, in the early morning hours. Also, whether you day or night fish, always make it a point to have your life jacket on and your outboard motor kill switch attached. Fishing from 5 a.m. until about 8 or 9 a.m. can show 3-4 hours of fishing in complete seclusion, especially on weekdays when fewer anglers are on the water. Late evenings are the same. You will have little company after 3 p.m. Daytime bass tournaments are over by 3 p.m. and all contestants are in. But be forewarned, look for a boat launch where there are no tournaments or make plans to launch your boat before 3 p.m. when most tournaments are over, for delays launching your boat can be 30 minutes or more. Even the evening crowds do not begin to get out until it begins to cool or when the sun begins to go down as late as 8 o’clock in the evening. So again, you can see, you can have 3 – 4 hours in some seclusion or often have some places all to yourself. Even recreational water vessels and water skiers begin to get off the water in the evenings. So as you can see, the mid mornings to early evening periods on Logan Martin Lake can be the worse times to be fishing the mid to lower main lake region. Those often, over bearing times at midday when you can expect to be fishing in a crowd. 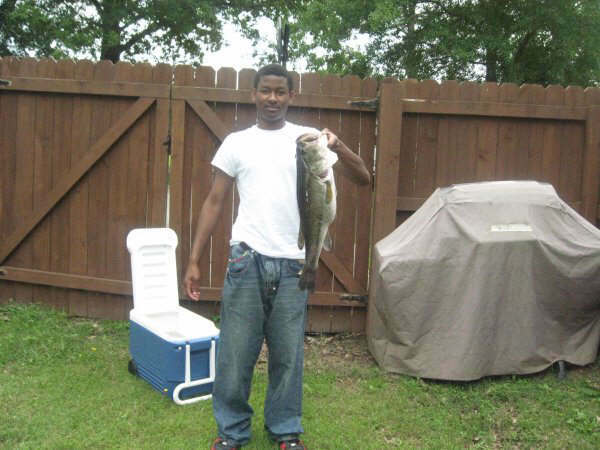 Or you can always fill up that boat for another $100.00 and head far up your favorite tributary or creek or travel far up the lake (above the mid lake I-20 crossing), where fewer boaters are found and Logan Martin’s bass are less disturbed by the summer crowds. So how about the fishing? There are many lures, various techniques and lots of locations to choose when you day fish all 50 miles of Logan Martin lake throughout this hot, summer season. Some techniques to fool the tenacious minded spotted bass and believe it or not some big bass lures Logan Martin Lakes big mouth bass never see. 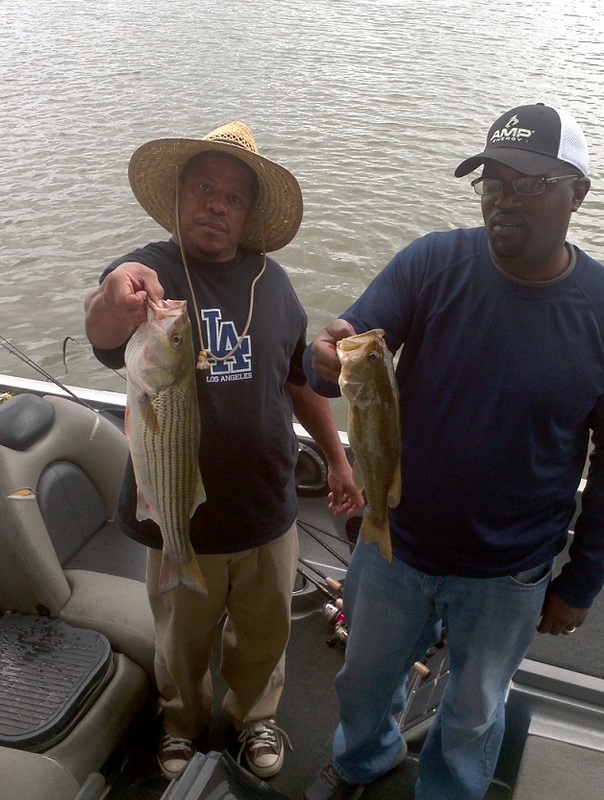 Its a given fact that the Coosa River spotted bass that make up this lake do like small meals. The recent rage in finesse fishing with small offerings in the past few years, shows small plastic worms, crayfish imitations, shad imitations and mini-sized plastic lizards all rigged on jig heads, can fool even the most temperamental spotted bass into biting. Often in some very clear water situations, downsizing your lures is all it takes to entice these picky feeders into striking your lures. But – as with any technique most anglers have not tried like these light tackle techniques – some may ask, ” is that all there is to it “? No, it is not. Lure choice, lure color, lure action, line type, line size, sharp hooks, the correct equipment choice and even the places you are fishing, will all help determine your success. Spotted bass also like fast moving lures worked in the mid water column, often with an erratic, injured-looking movement. Again, small gets more bites, but don’t rule out bigger lures in each category. Small crankbaits fished on 10-12 pound test line usually run in the 2-6 foot range, some small models with bigger lips run even deeper. Changing to a bigger profiled crankbait, one with a bigger body and more wiggle, that runs at the same depths, often triggers the bigger bass in a school of spotted bass. The same goes for fishing with floating and suspending jerkbaits, the two hook models. Changing to a more elongated version, those with 3 hooks, may get bigger bass bites within these schools of spotted bass. Very long casts, coupled with fast, erratic retrieves, creates some very rod-jarring strikes from these spotted bass. Rattling lipless lures, like Rattletraps or Cordell spots, always triggers strikes from summertime bass feeding on main lake flats. Small, quarter ounce versions get more bites, especially in clear water situations when bass see a lure much better. Bigger 1/2 to 3/4 ounce sizes may be needed for fishing deeper water with heavier line in the 17-20 pound test category suggested. Always rig two rods, one with shad colors and the other with crayfish colors. Spinnerbaits still fool a lot of bass on this lake. Although these spots and largemouth’s do see a lot of them, they can fool bass under a variety of conditions. Everyone fishes with a white or chartreuse and white spinnerbait. Changing to a rather off the wall colors like silver, black and white, or brown, black and orange or chartreuse, blue and white may trigger strikes from these color conscience bass. You can really mix up the colors on your spinnerbaits when adding another two toned skirt (2 skirts) or a contrasting grub or twin tail trailer to your spinnerbaits. Even colored blades look a lot different than the same old standard gold or silver blades. Although downsizing your spinnerbaits is suggested in clear water situations changing to bigger more gaudy sized spinnerbait may be needed. Like when fishing the stained waters found in the lakes head waters or the backs of feeder creeks after heavy rain. Or at night when bigger is better to aid a bass in tracking down your spinnerbaits. Trailer hooks are suggested for short striking bass. Topwater lures like zara spooks and buzzbaits are deadly. Even frogs in the grass get explosive strikes. Always try several sizes, colors, types and retrieves with topwater lures. 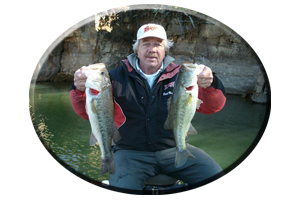 Even for spotted bass targeted on or near the lakes bottom bigger lures may get more strikes. Oversized, deep diving crankbaits are ignored by most anglers, but not by many bass suspended or near the bottom in water 10-15 feet deep. Big worms 8-10 inches long, are great summertime lures, rigged Texas style or Carolina rigged, they fool some big largemouth bass as well. So do oversized lizards, crayfish imitations, jig combos, tube baits, creature baits and jig combos. One type of lure many of Logan Martin’s bass have not seen are swim baits. 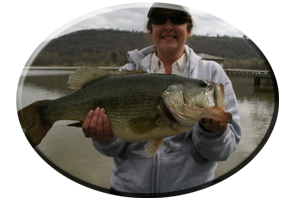 They can be smaller versions 4-6 inches long or the type of swim baits that exceed 10 inches, those that look like keeper sized bass. Generally fished with long casts and a slow, steady retrieve in clear water situations, these are big bass lures. Expect few strikes, but those you do get, hold on, for they generally are big bass bites from monster-sized bass. The bigger the swim bait, the less bites you get from the smaller bass.